He’s an evil dragon, so don’t feel bad. Navigate through 30 increasingly difficult levels (plus 3 bonus levels). This game was inspired by a love of the old D&D graph paper maps, 8-bit art and scary dragons. 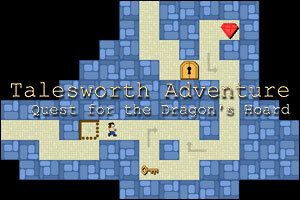 Talesworth Adventure 1 video walkthrough! One of the greatest games! The music was classy and the animations of the character and enemies are really cute and make it dynamic! Neither too long nor too short. Challenging, but sometimes goos luck helped a bit! Loved the game. Thank you to the designers. Just challenging enough and duable. Leaves you with a sattisfied feeling that you still can figure something out without help, just puzzle. Walk-through on bonus level 3 is flawed, one of the arrows in pointed in a different direction… in the walk-through the bottom left most arrow is pointed to the gem, in my game it is pointed away. Answers? On the second thief level how do you get the gem that he takes? You have to go back to the first level with the thief and kill him.